The Ensemble of Shattered Globe Theatre is pleased to present An Evening of Samuel Beckett starring renowned Beckett protégé and San Quentin Drama Workshop founder Rick Cluchey in Krapp's Last Tape and his own solo piece, Sam and Rick, in which he shares his personal experiences with the legendary Irish playwright. The two one-acts will play eight performances only, 2 - 12 May 2013 at Stage 773, 1225 W. Belmont Ave. in Chicago. Tickets are available at www.shatteredglobe.org or by calling the Stage 773 Box Office at (773) 327-5252. 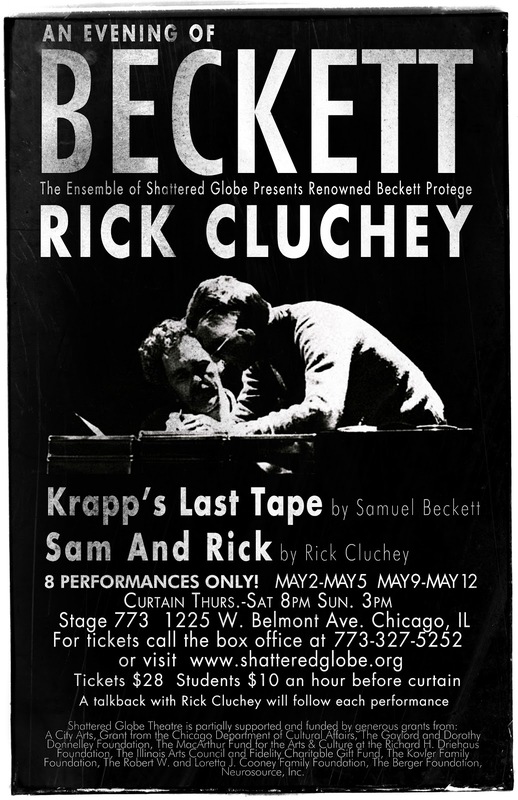 Chicago-born actor and playwright Rich Cluchey’s own solo performance, Sam and Rick, chronicles his unique relationship with Samuel Beckett, from his initial connection to the playwright’s work while incarcerated at San Quentin State Prison, to the close, seven-year creative partnership and friendship they developed after Cluchey’s release. Cluchey intersperses his monologues with media elements, using footage of prior productions and private moments with the playwright to weave together an “expression of life before and with Beckett." “Audiences will also have the rare opportunity to see Cluchey’s seminal performance of Beckett’s Krapp’s Last Tape, as directed by Beckett himself,” comments SGT Artistic Director Roger Smart. “This special evening by the preeminent interpreter of Beckett’s work is part of Shattered Globe Theatre’s ongoing ‘Other World Series,’ affording access to a diversity of voices and perspectives,” adds Smart. A tour-de-force for one actor, Krapp's Last Tape is a brilliant character study and a sad, astute examination of aging and regret. At a birthday party of sorts, Krapp sits in a darkened room with wine, bananas, and the tape recorder by which he tracks his existence. Rick Cluchey co-founded the San Quentin Drama Workshop (notably Beckett’s American theatre company of choice) while serving a life sentence at San Quentin State Prison. After his sentence was commuted, he toured Europe with his play The Cage. There, he began his seven-year collaboration with Samuel Beckett, serving as the playwright’s assistant director on a production of Waiting for Godot in Berlin. Cluchey eventually persuaded Beckett to direct him in Krapp’s Last Tape and Endgame – stagings he later remounted around the world. Cluchey’s life and work at San Quentin inspired John Hancock’s 1997 prison drama Weeds, starring Nick Nolte. He received an Obie Award for David Mamet’s Edmund, a Singapore Festival Award for Krapp’s Last Tape and was the first American to receive Italy's prestigious Premio de la Crítica literary award. In Chicago, Cluchey has performed his works at Victory Gardens Theater and The Goodman Theatre. Samuel Beckett is widely considered one of the most gifted and influential writers of the 20th century. His prolific body of work – including drama, prose, poetry, and more – spans the 1930s through the 1980s, and includes Waiting For Godot, Endgame, Happy Days and Krapp’s Last Tape. Defying simple categorization, Beckett has been referred to as one of the last Modernists, one of the first Postmodernists, and one of the most important Absurdists. In 1969, he was awarded the Nobel Prize for Literature.